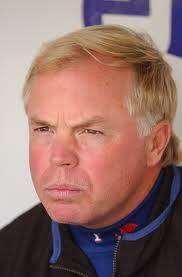 Soon turning 56, Buck Showalter eyes a championship in his near-future. Buck Showalter was a fine minor-league first baseman in the Yankees farm system. He had the poor luck of being at that position when Don Mattingly was bashing all those home runs. The only problem is there would be no World Series in 1994. The season concluded with 70 wins for the Yankees and a Major League Baseball work-play stoppage. In 1995, the Yankees won the first-ever American League Wild Card. They lost a heartbreaking series to the Seattle Mariners. Showalter was fired. The following season, the Yankees won the World Series and have barely ever looked back. Showalter was then tapped to build the expansion-team Arizona Diamondbacks. He constructed a superb club in a hurry. But he was dismissed at the end of the 2000 season. The Diamondbacks won the World Series the following year. The Texas Rangers were Showalter’s next stop. He was shown the door in 2006, a miserable failure truly for the first time in his career. Yet, in the heart of Dallas Cowboys land, the Rangers have been in the World Series in 2010 and 2011. One has to guess what might happen with the Showalter-led Baltimore Orioles, a franchise of underachievers since the mid-1990s. The rap on Buck Showalter is that he is a control freak and “over-manager.” Let’s hope he sticks it out to make a much-desired World Series appearance. In April, the baseball season is always being viewed thro the wrong end of a telescope. This entry was posted in Baseball, Yankees and tagged Arizona Diamondbacks, Baltimore Orioles, Buck Showalter, Don Mattingly, Major League Baseball, Montreal Expos, New York Yankees, Seattle Mariners, Stump Merrill, Texas Rangers, Wild Card, World Series. Bookmark the permalink. Great article, really informative. The Orioles LOVE Buck in Baltimore. A lot of fans think of him as their favorite player. Yeah, that much love. I can’t wait till the year Buck is able to turn the O’s around to a .500 season (and more), and I really hope it’s 2012!